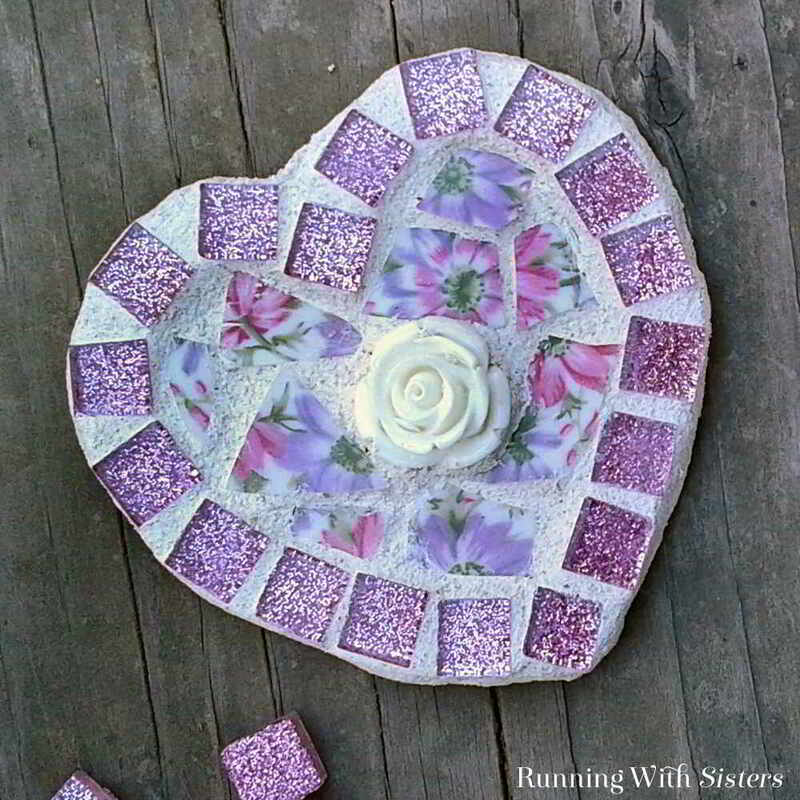 We love to mosaic, so we’ve got another super cute mosaic project to share: A Broken China Heart Mosaic! 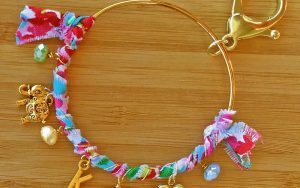 For this one, we started with a wooden heart from the craft store. Then we raided our mosaic tile stash. We always save the broken china tiles and mini tiles leftover from our mosaic projects. 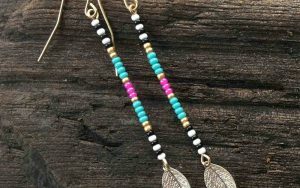 They are perfect to use in a project like this! 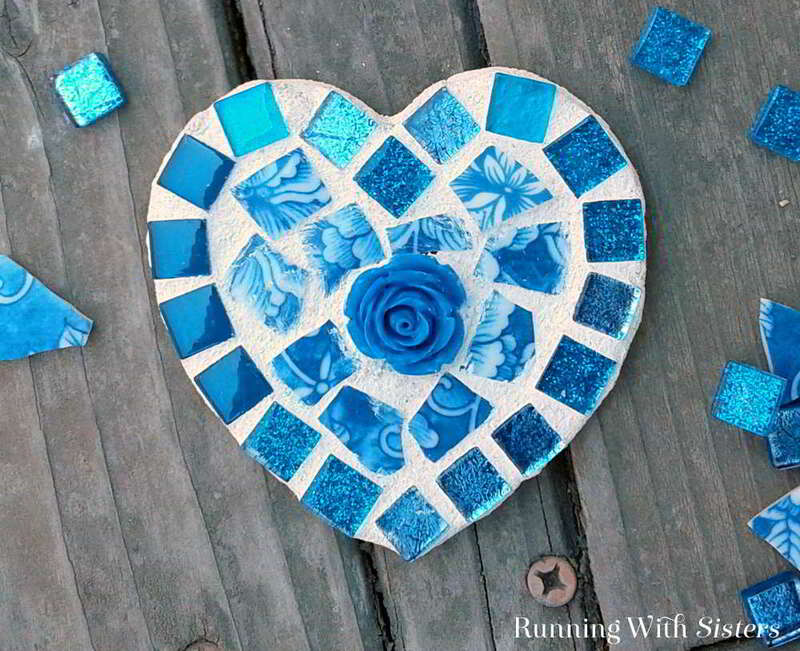 This Broken China Heart Mosaic is fun and easy to make, even for beginners. Here’s a video we made for our YouTube channel. 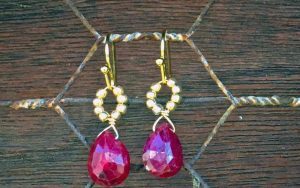 (Did you know we have a YouTube channel? Check it out and if you like it, please subscribe! We post a new video every week!) 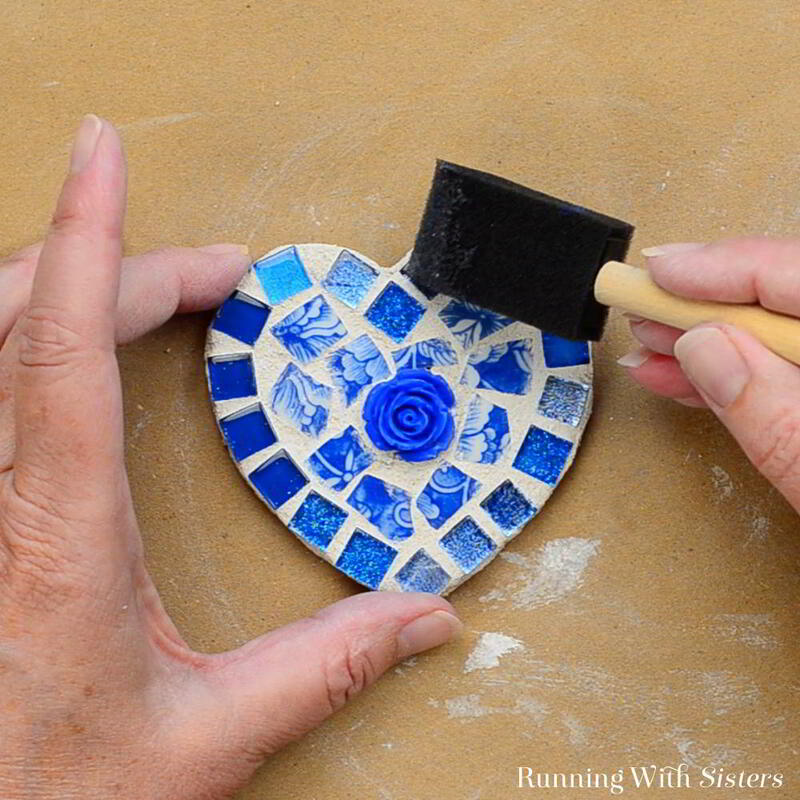 Follow along to see how we made the heart mosaic. Then use the steps below to make your own. 2. 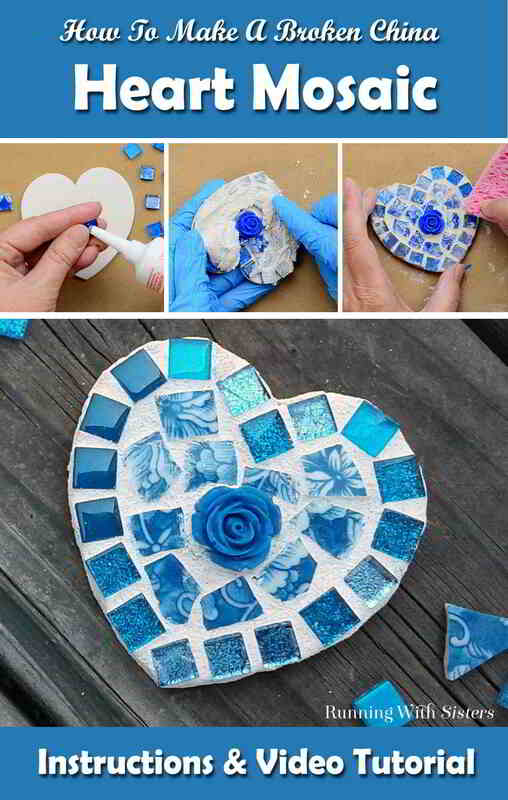 Play with the tiles, arranging them on the heart. 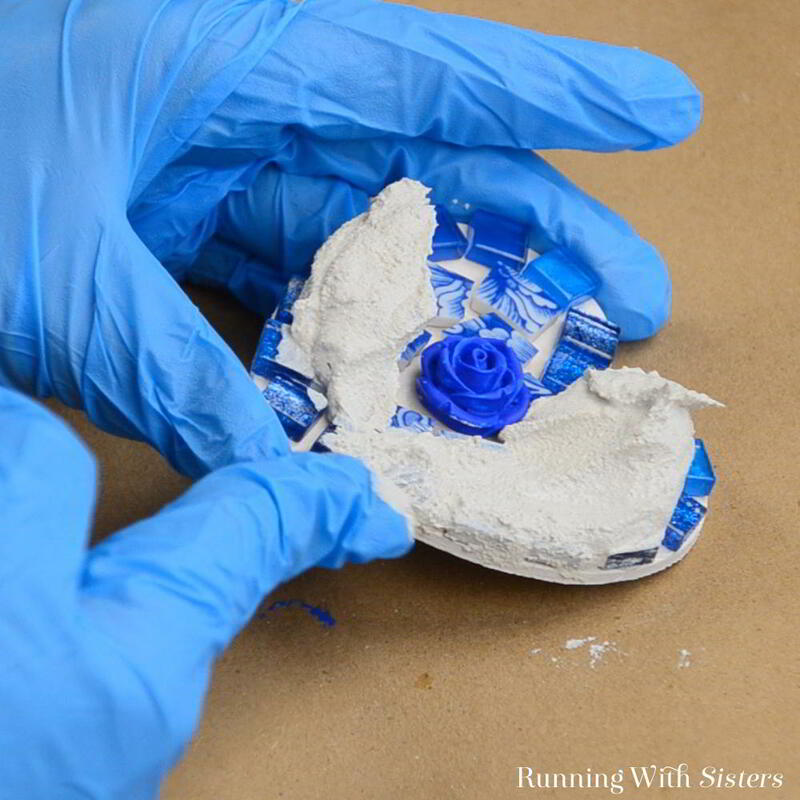 Start with the resin rose at the center then create a border or outline with the mini tiles. Once you have a border, it’s easy to fill the center in with the broken china tiles. 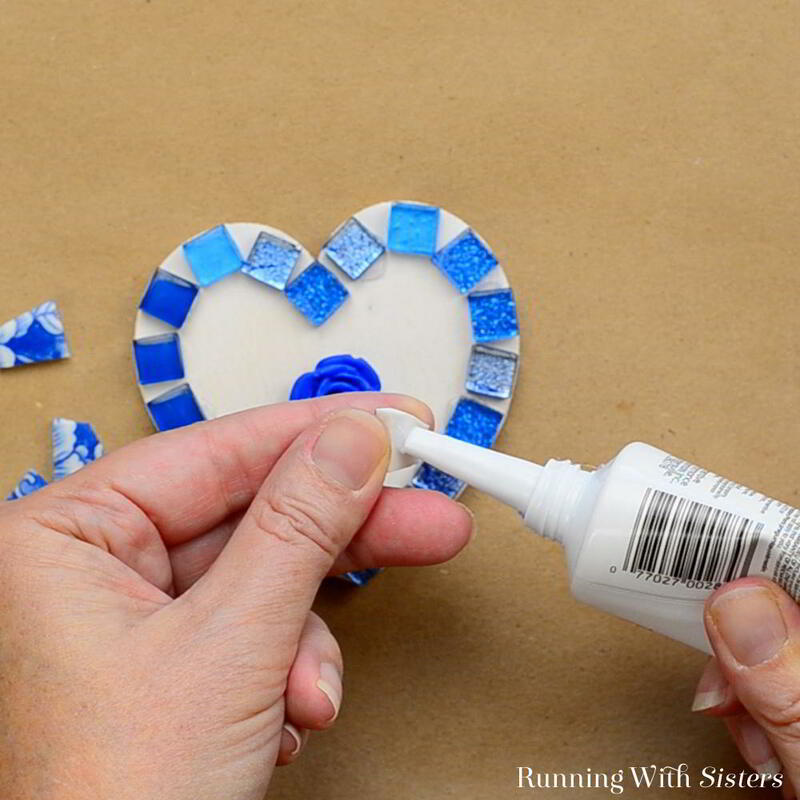 To glue down the tiles in your design, place a little silicone adhesive on the back of each tile. Then press the tile down on the heart. Some of the clear adhesive glue may come out from under the tile and show a little. Don’t fret. The next step, grouting, will cover that up. Let the glue dry for about 30 minutes or until you cannot move the tiles if you try to wiggle them. 3. When you are ready to grout, put on your gloves. To mix the grout, read the instructions on the grout package. Here’s what we did for ours: we measured a tablespoon of water into the mixing cup. 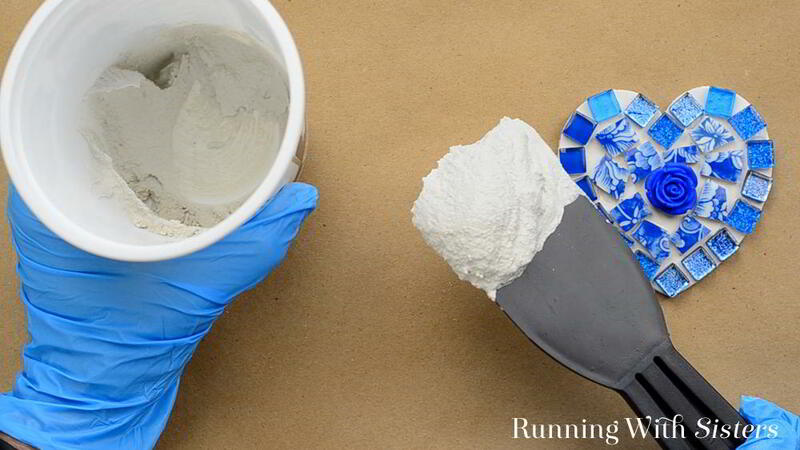 We dried off the measuring spoon, then added 3 tablespoons of powdered grout to the water in the mixing cup. Whatever your ratio of water to grout is, the next steps are the same. 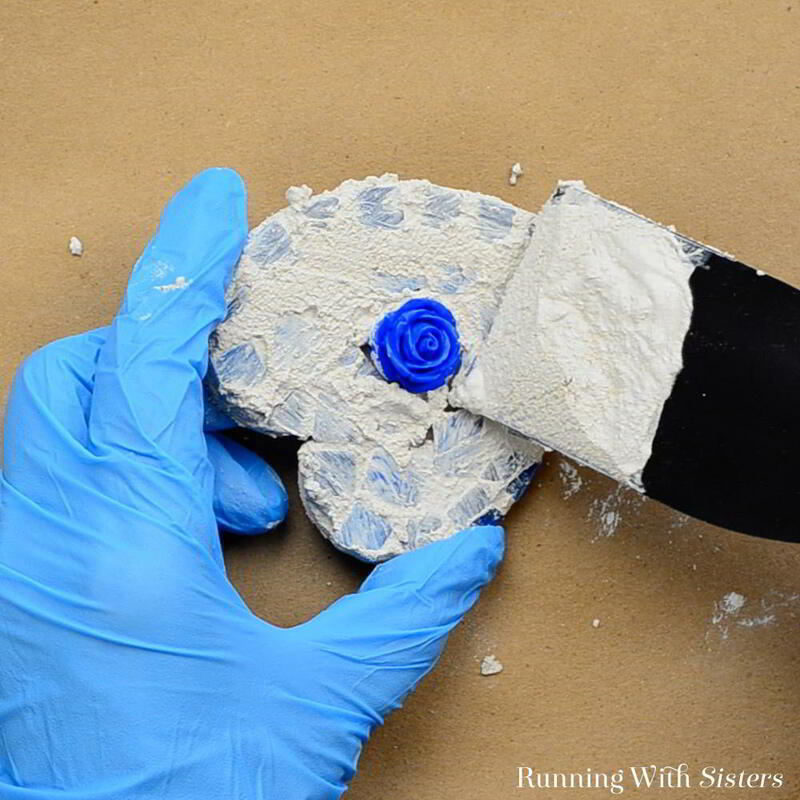 Mix the grout using the putty knife. The grout needs to be the texture of natural peanut butter–– not runny and not dry and crumby. So add water as needed to get that consistency. 4. Now you have about 15 minutes to use the grout before it starts setting up. Place a big dollop of grout over the tiles. 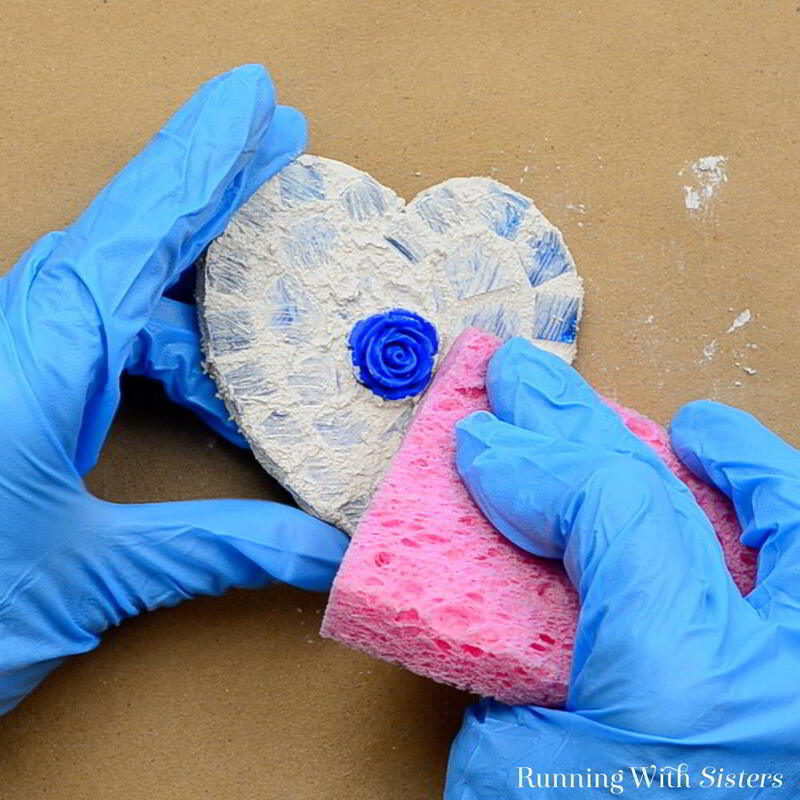 Push the grout around with the putty knife or your finger (with gloves on). You want to get grout around the edge of every tile and between every tile. 5. Dampen the sponge and squeeze it out so it is moist but not dripping. Wipe the mosaic with the sponge to remove any grout that is on top of the tiles. Try not to remove any grout from between the tiles. Rinse your sponge in the bucket as needed. 6. The grout will start to harden in about 15-20 minutes. As it does, a haze will form on the tiles from the grout. Buff the tile tops with the damp sponge or a paper towel and they will come clean. If the haze forms again as they dry, just buff again. 7. Let your heart mosaic dry and set up overnight. 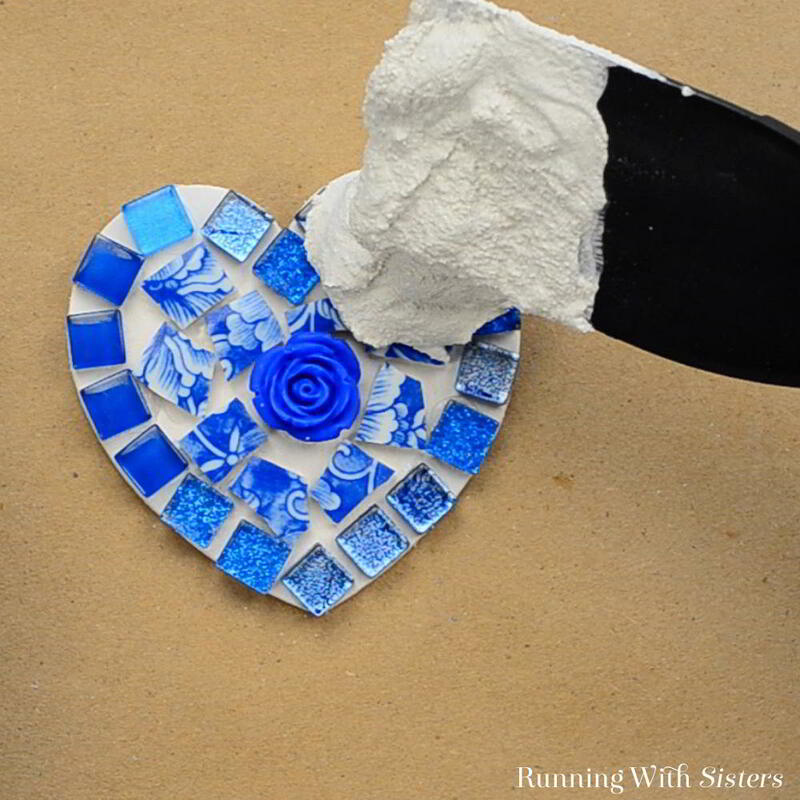 If you want to seal your mosaic, paint it with a coat of grout sealer and the sponge paintbrush. It only needs a thin coat. Paint right over the tiles and the grout. 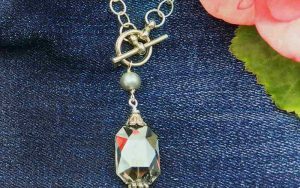 If you have any questions about this or any mosaic project, leave us a comment and we’ll reply. 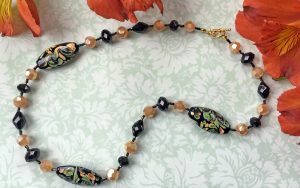 We love to mosaic!